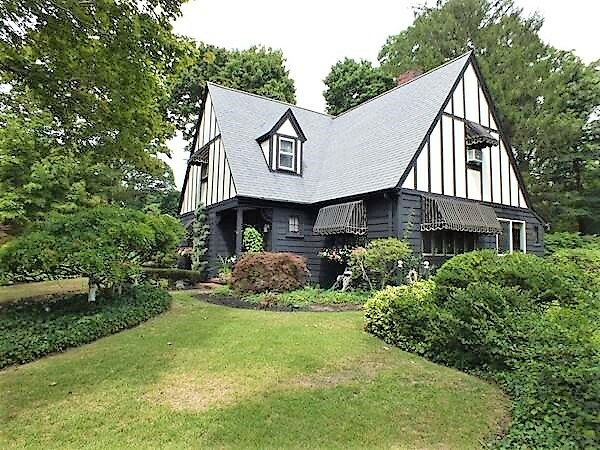 Once in a lifetime opportunity to own this 1938 Tudor with original charm and modern upgrades set on amazing, park-like grounds. Modern upgrades blend seamlessly with original character and charm throughout this home. A modern kitchen, a newer roof and furnace, replacement windows complement original hardwood flooring, crown moldings, 6 panel solid wood doors, a beautiful stairway and entry doors. The living room alone boasts original oak flooring, fireplace, huge picture window with custom bookcases. There is plenty of storage with gorgeous custom built-ins and large closets. The three season room with sliders overlooks the grounds featuring 2 sheds, a brick patio, pergola, paths through wooded areas that surround a seasonal spring fed pond with private sitting areas.